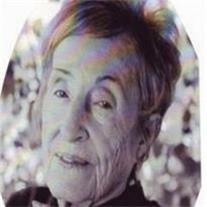 Allie Bean Reheis passed away on Tuesday, Sept 18, 2012 in Mesa AZ. She was 99. She was born in Mud Lick, Clay Co. TN on Feb 4, 1913, a twin in a family of 14. Allie was raised on a farm and learned to work hard. She married John Raymond Reheis on 2 Feb 1931. John passed away on 4 July 1987. Both were members of the LDS church. Allie and John have 5 children, Paul Reheis (Anita), Mary Alice Dukate (Don), Patsy Martin (Cecil), Jerry Reheis (Lonnie) and Steve Reheis (Donna), 19 grandchildren, 68 great grandchildren and 46 great great grandchildren with a total of 187 descendants. She is survived by two living sisters, Ruth Grace of Lafayette, TN and Marie Rhoton (Cornell) of Tompkinsville, KY. Allie was known for her southern style cooking and family and friends loved to enjoy her food. Allie and John lived in Owensboro, KY. for 31 years and moved to Mesa in 1964 to be with family. Allie worked at Mollies in downtown Mesa for 11 years. She was well known for her knowledge of ladies ready to wear clothing and had a good following. The Extended Family Assisted Living Home gave loving care and kindness to her in the last years of her life along with Hospice of Arizona. A viewing will be held on Sat Sept 22 at 9 AM with a service at 10 AM, both at Bunker’s University Chapel, 3529 E. University in Mesa. Burial will be at the Mountain View Cemetery.